If you are one of those individuals who have a blast taking night trips, you should without a doubt invest in some night vision binoculars. Your need for this pair of technology is independent of what you actually do in the dark. 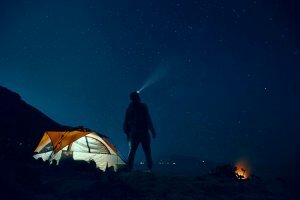 If you seize the cover of darkness to enjoy wildlife in their natural habitat, explore caves, fish, go camping, boating or hunt, whichever you are into, you will need a pair of night time binoculars to improve your vision in the pitch black night. Sure you might have the regular pair of binoculars, or if you are up to date with your tech, you probably own one of the latest camera binoculars designed to take pictures of your target object even in low light. But remember, low light situations are nothing like the pitch black darkness you will experience in the caves, or while on a lake at night. As such, while costly, they will do squat for you while in the dark. You probably think about it by now, but let me just cut you short. Using a flashlight to improve your binocular vision will only work to scare away any wild animal around you thereby ruining your experience altogether. Night vision binoculars are perfect for when you want to move around undetected and still get clear images. Animals have been created or over time evolved (depending on which creation theory you subscribe to) to be able to see in the dark. Humans do not have this ability and as such to compensate, they come up with innovative ways to counter their inhibitions. Night vision binoculars are one of such creations. With regards to technology and functionality, night vision binoculars work in a similar manner as the digital cameras. While they may vary in size and price, they are nearly as powerful. After deciding on the use of your night vision binoculars you are ready to enjoy what the night has to offer. If you do your homework well and choose the best night vision binoculars, you just might see better in the darkness than some nocturnal creatures. Fascinating right? As you prepare to get yourself a clean pair of night vision binoculars, it is probably wise to have some bit of understanding of how they work. Just how do they turn night into day? Do they create their own ‘invisible light’ and illuminate it before us? Why does the hue of your vision through the binoculars change? All these are questions we seek to answer in this portion. First and foremost, it is important to note that night vision binoculars technology does not in any way emit its own light. What these binoculars do instead, is capture any and all types of light, no matter how low or weak, and amplifies it. Light from the stars and the moon is sufficient to make this gadget work its magic. The unit also taps into the infrared spectrum light and directs it to your eyes. Most of the night vision binoculars come equipped with infrared illuminators whose work is to intensify the infrared light in your environment. Simply put, night vision technology captures any ambient lighting, and amplifies it through an electrical and chemical process inside the binoculars. It is this electrical and chemical process that converts the photons into electrons. The electrons are then contrasted by a phosphorus screen which converts them into visible light thus allowing you to see in the might. The image seen has a green hue courtesy of the source of light. But regardless of the hue, the image is clear. Comparing daytime binoculars to night vision binoculars, the latter do not have impressive magnification abilities. But be it as it may, and given the lighting conditions, they do bring a fair amount of distance into view and focus. Also, while the magnification is shorter, the image is far much clearer. Now, the working of the night vision binoculars is dependent on the lighting conditions. If the sky is devoid of the stars and moon, chances are your binoculars (especially if it is low-end binoculars), will not show anything. And understandably so – they are pieces of technology and not miracle workers. The minimal amount of light available, the stronger the night vision unit needs to be. That said, we cannot emphasize enough the need of having the best night vision gadget on the market for your nighttime escapades. Depending on the technology the unit employs, you can see up to 200 yards from you on a moonless and cloudy night. In the section above we have outlined the general working on night vision binoculars. Here we shall detail two technologies used to realize the functioning of these gadgets. This process provides you an image by collecting all the tiny bits of light including infrared light and amplifies them making an object visible. While these rays of light may be invisible to the human eye, the night vision binoculars are equipped with technology that can pick them up. Image enhancement technology also has the ability to amplify light that is reflected by objects. The infrared light spectrum is picked up by this tech. you can look at this tech this way; image enhancement can almost create something out of nothing. This tech works almost the same way as image enhancement. The only difference is that it picks up on rays appearing on the upper part of the infrared light spectrum. It turns heat into light. Warm bodies emit their own light which the thermal imaging tech can pick up on. A live being emits more heat than a dead being like a building and even more than plants. The infrared light produced by an object is focused on by a special lens contained in the binoculars. The light is scanned by the detectors and a pattern is created using the heat signature, this pattern is referred to as a thermogram. The entire process though sounding complex and lengthy only takes a fraction of a second. The thermogram is transmitted to the phosphorus screen as an electrical impulse after which an image is formed. Now that you understand the different technologies used, let’s have a look at some of the factors that you should consider when choosing the best night vision binoculars. Given the many different types of night vision binoculars on the market, you cannot possibly overlook these factors. If you are into hunting and do so in a wide and open area, you will need a unit with greater magnification what a brush hunter would need. If the goal is to observe nature, then you will need to determine just how far you will need to be from the wildlife to be safe and still have a great experience. For both of these cases, it calls for you to check on the detection and recognition ranges. After determining what you are into, now ask yourself how dedicated you are to the task you have identified. Will the unit withstand a fall or a drop? Is the unit you have your eyes set on waterproof? If not, is it still useful for exploring and hunting? Consider the features of the units and match them up with your needs to choose the best unit. How serious are you with your night vision binocular purchase? If you are after a picture perfect image, then you will have to invest some considerable amount of money in a good and quality unit. This is more so if you are a hard-core hunter. But if you are just a casual user, then you can afford to forego some features and save on the costs. Generation is probably the biggest determinant of price with any night vision binoculars. We shall not get down into the intricacies of this technology, but instead, we shall highlight what differentiates between the different generations. These are best suited for night vision beginners or for casual observes. They are cheap and affordable and provide a decent user experience with night vision. This generation is best suited for some considerably serious tasks including hunting, the study of nocturnal animals and other more serious observations. They are medium priced and have more than okay image clarity. Truth be told, magnification and night vision do not really blend in well together. In most cases, night vision binoculars magnification is lower than that of daytime binoculars. Generally, when you go past the 6X magnification, you will start to notice some flaws in the image clarity when using night vision binoculars. As such, even when a unit comes with greater magnification, it is advisable to stay well under 6X. A golden rule of thumb is to use the 4X magnification. Night vision binoculars are already large courtesy of the night vision tech the binoculars have to be fitted with. As the magnification ability increases, you will also notice a significant increase in the binoculars size as well. This is necessary in order to present a clear image. Also, the higher the binoculars generation, the smaller the expected sizes. Why is this? Well, the tech used in the binoculars as you move up the generations is more powerful and smaller hardware is needed which translates to smaller binocular bodies with greater magnification abilities. While the night vision is not heavy in itself, when compared to daylight binoculars, then you start to notice the weight. A unit with a 5X magnification ability (night vision binoculars) generally weighs about 30 ounces. When choosing a unit, test out the lighter and smaller binocular versions as they just might be dim or blurry. In addition to this, bear in mind the length of time you will be using the unit. A light unit is best if you will be holding the gadget for prolonged periods. The ability to attach the binoculars to an IR illuminator is a plus. Given the general size of binoculars, carrying one by and still using an illuminator may be difficult. Being able to attach one to the unit will be useful and convenient for you. Night vision technology is fragile to be quite honest. As such, a unit with a water/weather resistant exterior design will serve you best. Having an automatic brightness control is also preferred since it will make your observation comfortable. As the light levels fluctuate in your environment, this feature will come in quite handy. With the consideration factors out of the way, let’s have a look at some tips that will ensure you have a great buying experience. Many night vision binoculars buyer make the mistake of getting binoculars that can serve one specific purpose. You, however, should avoid this pitfall and get one that will be utilized for a range of purposes with great efficiency as well. You will always come across some cheap alternatives. The increased supply has caused the prices to be varied. However, while you can choose to get a cheap unit, remember that you will always get what you pay for. That said, we cannot negate the fact that there are indeed some cheap units with low light sensors that provide great image quality. Getting used binoculars may sound like a bargain. However, you should have it in the back of your mind that the lifetime of the binoculars is not infinite. They have a lifespan. The image intensifying tubes with time deteriorate and reduce the quality of output it provides. Think of the whole thing like a light bulb. Assuming they cost the same, though with the same depreciation, would you get a second-hand light bulb? Before you get your binoculars, read up on the pros and cons of the units. If you can, read up user reviews to get an idea of just how well these units served their owners. Still, on this point, you should be careful not to accidentally purchase the regular binoculars. It might sound obvious but many customers have made this mistake before. There are some units that are branded with statements like ‘visibility in low light’. Do not mistake such kind of branding for night vision. 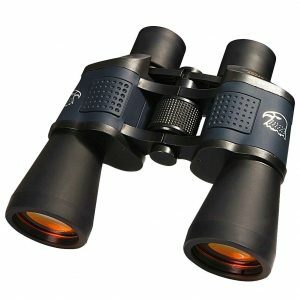 Night vision binoculars and normal binoculars look the same to be very keen, especially when purchasing online. So as to be confident with the quality of unit you will purchase, you should do some research on the seller as well. Ensure that they have a history of selling high-quality units and at the best price too. To be safe, you could prefer sites like Amazon that have been licensed and that have securities in place to protect your transaction. When you first lay your eyes on this device, the first thought that will pop into your head, if you are honest enough to admit it to yourself, is that it is an odd looking device. This is not to say that it is not beautiful. As a matter of fact, as a tech device, its design is appealing to the eye. Now, Solomark is one of the leading brands on the night vision binoculars industry. This particular unit, the Solomark Night Vision Monocular has grown in popularity and most users have nothing but praise for the unit. but the question is, is the unit really worth all the praise it is getting or does it fall short? To start with, we should point out the fact that the monocular is a generation 1 gadget. Nonetheless, the unit comes with a host of features that make it so difficult not to fall in love with the gadget. The unit is designed to be compact and very lightweight which makes it very versatile. Put into numbers, the unit weighs 11.5oz. and measures 5.8in x 4in x 1.85in.You can put it on different night time activities. Being a lightweight device, you can handle it for prolonged periods of time without getting tired. The monocular is designed to be sensitive to low light. Even without coupling it with the IR illuminator, this night vision unit is able to deliver great and usable images in dim light. This feature alone makes it stand out from the sea of units that provide low-quality images without their IR illuminators. You feel like you have gotten a bargain when you purchase this unit – which in actual sense it is. In addition to its low light sensitivity, the unit also features an image and video functionality. With the monocular, you can take videos and photos when you please. In addition to this, you can record the videos you take. To allow you to record lengthy videos and take lots of pictures, the unit comes with a 4GB Micro-SD card. This storage is expandable up to 32GB. In addition to the Micro-SD, the monocular also comes with a USB port. This port is designed to allow transfer of data (videos and photos), to a PC. Inside the monocular is a color LCD screen which provides you with clear videos and images. The images and videos have a resolution of 640 x 480 while the LCD screen comes with a resolution of 320 x 240px. For flexibility, the unit comes with a 7 level variable IR illumination. With this option, you can get the right brightness on the images you view. 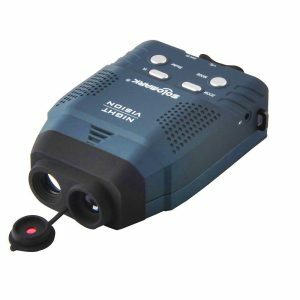 Speaking of viewing images, the unit comes with a zoom control that has a maximum of 2X magnification. The magnification levels start from a 1X increase to 1.3X, 1.6X and then finally 2X. The monocular has a 14-degree field of view and has a detection distance of 100m for man and 300m for vehicles. Lastly, for safety and convenience purposes, the unit comes with a binocular harness. In addition, it can be mounted on a tripod for when you are observing your objects for a long time and need to relieve your hands from the tension and fatigue that builds up over time. The exterior of this unit is covered with soft rubber which increases your grip and cushions it when it falls thus protecting it from damage. This Solomark night vision monocular runs on 4 AA batteries. These batteries can last for 5 hours. When looking for a high quality and affordable night vision binoculars, you should consider this unit, the Aurosports 10X25 Folding High Powered binoculars. While the brand may not be as popular as many that you have come across in the past, its low price, coupled with high quality and features have won over the hearts of many individuals who go ahead to sing its praises after purchase. 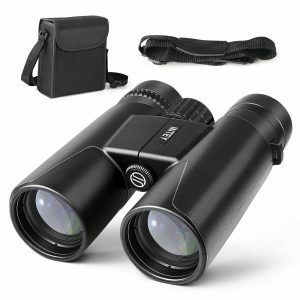 It is a perfect binocular for bird attaching, both during the day and at night. We should point out that the unit has low light level sensitivity for its night vision technology. This is efficient, but you will not be able to see anything in total darkness. This should however not be a factor to discourage your purchase since other units also cannot work in total darkness. With regards to its field of view, the unit can focus on your target 1000 yards away while still providing you with incredible detail of the object in the distance. Speaking of which, the unit has a 10X magnification and 25mm objective lens. The unit comes with multi-coated lenses which help to reduce lens reflections and also improve the clarity of the image as well as offer protection to the lenses. For comfort, the unit comes with a hyper-durable anti-slip grip. This allows you to handle the unit even with wet and slippery hands. In addition to this, and where the unit beats most products, it is waterproof. 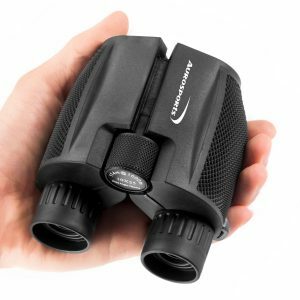 The binoculars are best used with kids and adults alike and are perfect for exploring, hiking, sailing, viewing, outdoor sports, concert and bird watching. For most people when darkness covers the land, adventure stops. But if you are one who will invest in the Bushnell 260501 Equinox Series 6L, this is something you will not have experience. While there are many other companies on the market, Bushnell has carved out a place for themselves over the years. 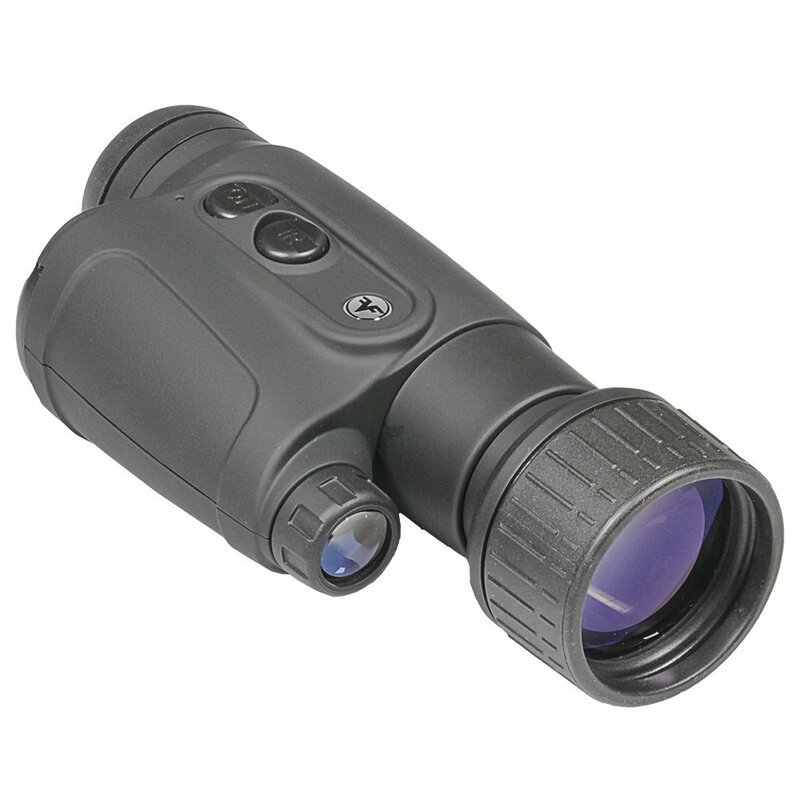 Now this Bushnell is a powerful infrared illumination and has very high performance glass objectives. With the powerful infrared illumination, the unit is able to provide you with images in low light environment. Adding to this, the unit comes with a magnification power of 4X which agreed is not the best we have seen but still decent enough. This magnification is coupled with a 50mm objective lens. For the housing, the unit is designed with a ragged exterior for an improved grip. In addition to this, the housing is made to be water resistant which makes the unit usable in high humidity environments and even in the rain. Just be sure not to leave it expose to the rain for prolonged periods. The Bushnell 260501 is designed to be tripod mountable for convenience and also comes with a video out capability. Speaking of video out functionality the unit can not only be used to capture video but also to record video. Last but not least, the unit runs on two convenient double AA batteries, and weighs 1.6 pounds. If you’re an individual for whom an environment of darkness does not stop your sense of adventure, then investing in Occer 12×25 Compact Binoculars is extremely worthwhile. The unit is designed with a large eyepiece containing a smooth center and is provided with a right eye focus knob for easy and precise focal adjustment. This unit of binocularshas 12x magnification, 25mm objective lens and wide field of view, 273ft/1000yds, permitting to look farther and see wider. The compact binoculars have 15mm big eyepieces, allowing images to be seen more clearly than other sets. Additionally, the unit has adjustable eye cups which can be pulled down to fit the user. 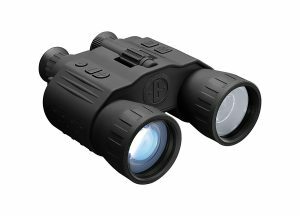 The binoculars are extremely light in weight and are covered with BAK4 prism texture. The unit’s objective lens uses optical FMC multilayer broadband green film, while the eyepiece-optical is made of blue FMC coating. This design can mostly reflect the light to give a good and clear image. The binoculars are made of ABS plastic and come with a binocular strap, allowing the unit to be used hands-free. The binoculars are very small in size, usually fitting into pockets. Additionally, the unit has a nonslip rubber outer shell, especially, made for a shockproof, water resistant piece with a secure grip. 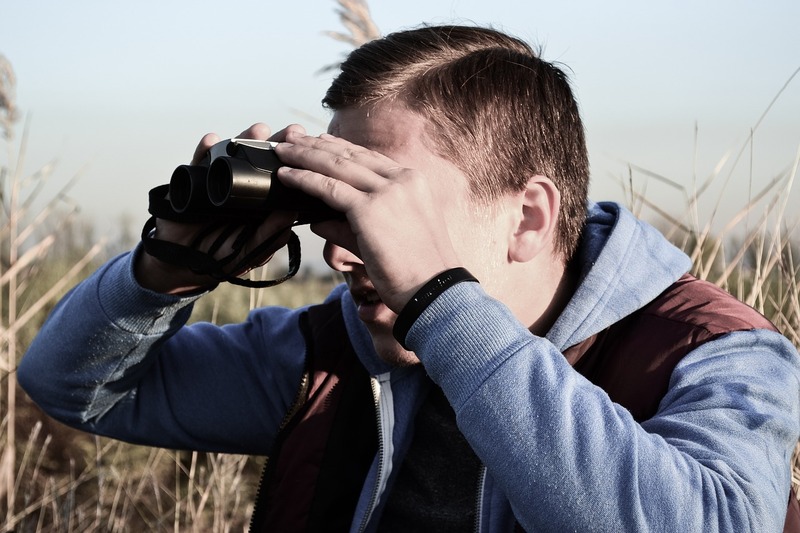 The binocular is portable and compact, making it easy to use with even one hand. This feature of the set permits it to be used for various activities like – opera, bird watching, camping, traveling, watching football games or other outside activity. Wangyishengshi DAXGD Binoculars is an 8×35 High Powered Military Optical Telescope with Strap Backpack Lens Cap as well as Eyepiece Cap, making it one of the best sets in this class. It has 8 x magnifications along with auto focusing, giving the user a visual range up to 9800 feet. The unit is designed with an ultra-wide angle optics system and 50 mm Lens diameter, allowing the user to expand the scope of the observation. Additionally, the set has strong optical lenses making it useful both in the day as well as at night. The set does have one drawback as its night vision function is the Hd LLL night vision and not infrared night-vision. So, it can only be used in the faint light environment and not in total darkness. These binoculars set has multiple purposes as it can be used for traveling, stadium sports, bird watching, concerts, hunting, hiking, etc. 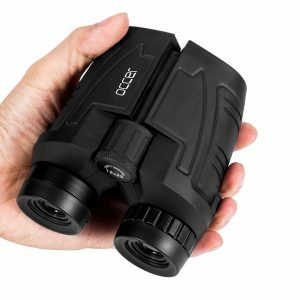 If you’re looking for a good pair of low light night vision binoculars, then no need to go further than the SGODDE 10×25 Binoculars set. The unit is blessed with 10x magnification along with 25 mm objective lens, which gives a wide view of 362 feet diameter as far as 1000 yards. The set can be used for both day and night, but it can’t be used to see anything in thorough darkness. The unit boasts of all its lenses being made from Bak-4 prisms with FMC multi-layer broadband green film, which increases the light transmittance up to 99.5% for brighter and higher-contrast images. The set also has an adjustable eye width and is extremely focusable with a large and easy center-focus knob to fit different view distance and making it easy to pull focus. The outer cover of the set is made up of Non-slip Rubber Armor, which is specially known for its shock absorbing property as well as for providing a firm grip. The durable rubber texture anti-slip grip also safeguards against careless falling or accidental crash. The set is also waterproof (Grade IP4) and dustproof. Last but not the least, the unit is blessed with contemporary styling, light weight and is very compact and is convenient and easy to carry. All these properties make the unit fit for hunting, hiking, exploring, viewing, sailing, bird watching, concert, outdoor sports etc. 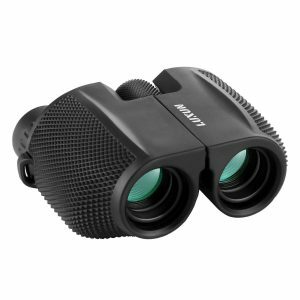 INTEY 12×42 Folding Binoculars is a top-of-the-class night vision binoculars with 12x magnification, 42mm objective lens and 22mm diameter eye lens. These dimensions of the unit give it an edge over other sets as it allows much more light to come through making a clearer picture. The bigger eye lenses provides a wider and more comfortable watching experience. The unit boasts an easy operation that provides broad vision and allows easy focusing of the goal image to display clear pictures accompanied by a rotatable eyepiece which is designed for both naked eyes as well as customers who wear glasses. The outer body of the binoculars are made out of non-slip rubber-armored foldable body, making it portable, compact as well as water resistant. The set also has fold-down eyecups with 7x6x3 packing size and weighs only 1.57 lbs making it lightweight and easy to carry, store and use. The unit is perfect for bird watching, camping, hiking, trips, fishing or for stargazing in upcoming spring holidays. Other than that, it may also be used as the night vision binoculars with dim lights to enjoy a wonderful live concert or a fierce football competition in the spacious stadium. The Firefield 5×50 Nightfall 2 Night Vision Monocular is a magnificent unit with high magnification power and has large objective lens. It weighs about 1 pound, making the unit lightweight, portable and easy to operate. The unit has a high power built-in infrared power-saving PULSE IR illumination making night vision or low light vision a wonderful experience. The lenses of the monocular have a relative aperture of 1:1.4, which allows the set to give high-quality image and resolution. The unit is ergonomically designed with glass being used as the lens’s material and the body being plastic and requires 2 CR123A batteries for power. Its fully weather-resistant design features a modern, rubber-armored housing for exceptional portability and durability. These features permit the unit to be used for a wide range of uses including night time hunting, search and surveillance and general observation. After making such a considerable investment of your hard earned money, the last thing you would want if for the unit to get damaged only after a few weeks of usage. To ensure this is never your story, you have to take great care of your unit. The very first thing that you should work hard to remember is that exposure to bright light damages the components of night vision binoculars. As such, you should strive to keep the device away from light. Also, while these tech gadgets are designed to be used at night when it is damp and humidity levels are high, in the fog and rain. However, note that extended exposure to rain and high humidity can damage the device. To clean the lenses, you should do it in the same manner you would the lens of a camera. Since it can easily be scratched, use non-abrasive material to wipe the lenses down. Generally, for safe keeping, store the unit in a cool and dry place. With this guide, you are more than equipped to make an informed decision on purchasing the best night vision binoculars. Enjoy seeing the world in a green hue – it is a great and rewarding experience.